Motorola has recently launched the Moto G4 Play smart phone in India. The price of this smart phone is around Rs. 8,999. It will be available only through online shopping site Amazon India in Black and White colour. The Moto G4 Play was first launched in May just after the Moto G4 and Moto G4 Plus were announced in the country. Its siblings are better and in fact it also reflects in the significant price difference. The Moto G4 is priced at Rs.12499, while the Moto G4 Plus starts at Rs.13499. The Moto G4 Play runs on Android 6.0.1 Marshmallow, and like several other Moto smart phones that comes with a water repellent nano coating. This smart phone bears a 5-inch HD (720×1280 pixels) display. It is powered by a 1.2GHz quad-core Qualcomm Snapdragon 410 SoC paired with 2GB of RAM. The Moto G4 Play offers 8 Megapixel rear camera with LED flash. The front facing camera sports a 5 Megapixel sensor and the company is also touting about its display flash feature. The Moto G4 Play consists of 16GB of inbuilt storage that’s expandable storage via microSD card (up to 128GB). 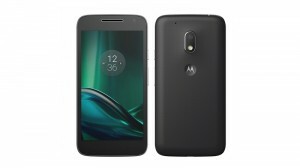 As for connectivity options, the Moto G4 Play offers 4G LTE, VoLTE, Wi-Fi 802.11 b/g/n, Bluetooth 4.1, A-GPS, and Micro-USB. The smart phone is powered by a 2800mAh battery and the Moto G4 Play also comes with a 10W rapid charger included in the box. It is claimed to provide 5 hours of battery life with 15 minutes of charging. Front Camera: 5 Mega Pixels.